In the 1990s I was living in a small village in Hertfordshire about 35 miles north of London. As far as my own participation in squash was concerned, I played at local clubs and helped to organise competitions at one of them on the Cambridgeshire border. It wasn’t, and still isn’t, a highly-populated area. Yet 40 minutes away by road was the Galleria Shopping Centre at Hatfield. 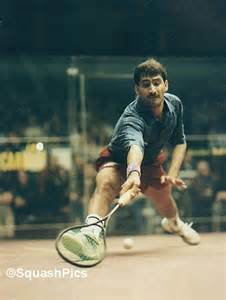 And from 1996 to 1998, the top eight male squash players in the world gathered there to compete in the World Super Series event. In March 1996, local boy Del Harris from Essex took the title, beating Australia’s Brett Martin 10-8 7-9 9-4 6-9 9-2. It was the second noisiest squash match I’ve ever witnessed. En route to the final, Harris had knocked out World Number 1 Jansher Khan in the noisiest. It was Khan’s first defeat on the World Tour for over two years during which he had beaten Harris in the 1995 World Open final in Nicosia. Twelve months later, Jansher and Martin contested the final, Jansher winning 9-7 9-5, 9-2. As in the previous year, point-a-rally scoring was used with a tennis-style ‘advantage’ system coming into operation should the score reach 8-all. 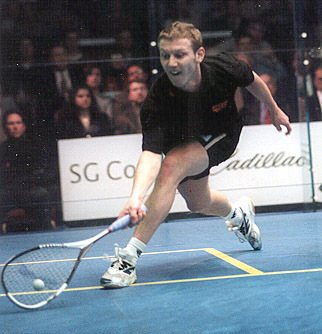 In 1998, two of the world’s top eight players, Jonathon Power and Ahmed Barada, were absent through injury, their places being taken by world-ranked number 9, Del Harris, and number 10, Simon Parke. To the surprise of many, it was Parke who reached the final where he found himself up against Jansher, now ranked World Number 2. To say that Parke was a popular figure at the time would be an understatement. In December 1995, he had been diagnosed with testicular cancer. The following month, he underwent surgery followed by treatment which included chemotherapy. Just four months after his surgery, he had returned to the professional squash circuit. Now, playing as well has he had ever played, he had a shot at Jansher, who was then British Open champion and had won eight titles in 1997 alone. Despite vociferous local support, the match proved a challenge too far for Parke who lost 15-12, 13-15, 15-11, 15-10. But, unbeknownst to me and the rest of the Galleria audience that Sunday evening in March, the encounter was have a final twist in its tail. 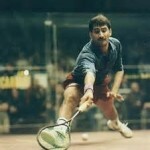 Having won 99 tournaments during his long and illustrious career, Jansher Khan would not win another title again. Thanks to Squashtalk for their listing of Jansher Khan’s 99 titles. This entry was posted in Squash Lives, Squash Players, Squash Tournaments and tagged squash court, squash match, squash matches, squash players, Squash Tournaments, World Open Squash Champion by Peter Heywood. Bookmark the permalink.